St. John’s Episcopal Church in Poultney reopened in 2014 after over 80 years closed, since 1931. Saturday, July 25 — EAST POULTNEY — The historic St. John’s Episcopal Church in East Poultney reopened for this summer in June as a summer chapel with weekly worship services every Saturday at 4 p.m. Service of Evening Prayer is led by local Episcopal clergy and the rich notes of the original 1840s William Nutting hand-pump organ accompany hymns at many services. At other times violin, flute, guitar and folk harps play the music. The Saturday, July 25, a Welsh service in honor of this region’s rich Welsh heritage will be officiated by The Reverend Christopher David. These services are a rare opportunity offered to worshippers, historians, musicians and lovers of early Vermont. Untouched and unchanged, St. John’s is one of the two churches from the early 1800s surviving in this village. St. John’s is a fine example of classic New England Carpenter Gothic. It retains its gated pews, kerosene lamps, stenciled walls and a rare, hand pump, organ made by Vermonter William Nutting, which dates from the 1840s. The cornerstone of St. John’s was laid May 27, 1831. The first services were held a year later, May 27, 1832. The first Episcopal Bishop of Vermont, the Rt. Rev. John Henry Hopkins, presided at the consecration of the building. When the church was erected East Poultney was booming. It boasted two large inns, mills along the Poultney River, a debating society and a library. Clarks, Hugheses, Lewises, Thralls, and Teetors rest in the adjacent St. John’s Cemetery, families still in Poultney, or as many who left only to return, who are a testimony to continuity. The arrival of the railroad moved the center of town activity west, and members of St. John’s church then built another Episcopal church, Trinity Church, in the new hub in the 1860s. St. John’s held regular services until 1931. After that the old church opened only once a year for an annual service of worship. The summer of 2014 brought the first reopening since 1931. Since the closing and sale of Trinity Church, attention is focused on St. John’s Church. Members of the executive committee of the church stress that the services are open to all as they usher in this second year in the 21st century in the life of this venerable, old house of worship. 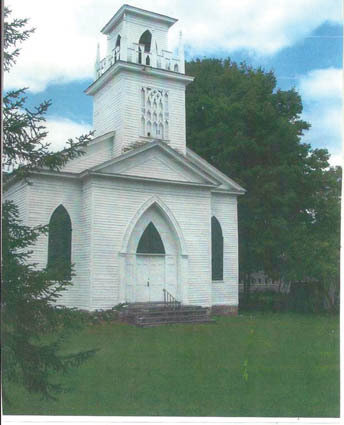 St. John’s Church is located on Route 140 in East Poultney, across from the village green, which is dominated by the stately United Baptist church. For more information, please call The Rev. William A. Davidson (518- 499- 1850), Chair, or Ida Mae Johnson (802-287-9744) of St. John’s Executive Committee.